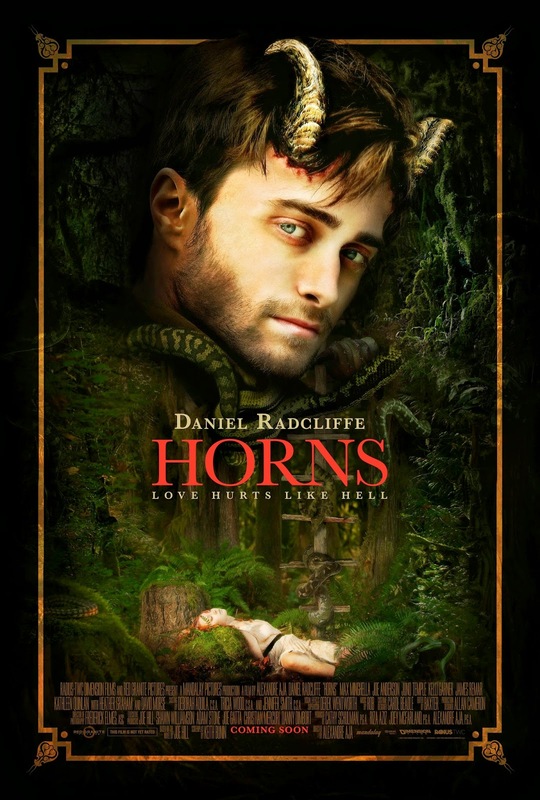 In the opening moments of Horns, Daniel Radcliffe and Juno Temple lay in a green meadow fawning over one another and exchanging hip yet still cheesy dialogue about being horny and then loving one another for the rest of their lives. It is a short scene that quickly moves us forward to after the major incident that defines the narrative of the film, but is an exchange that makes you wonder. Wonder in the sense that these two intelligent and clearly ambitious actors who want to make art that is substantial and means something have this opening that works contrary to all of that. Radcliffe has been picking projects in hopes of distancing himself from his Harry Potter counterpart for a few years now, but as he and Temple exchange this obvious exposition dialogue clearly intended to tell us these two are in love and doomed because of it (while ironically forcing it to counter-intuitively feel effortless) I wondered what they saw in this script. What about these opening moments made them think this was a good idea? What spoke to them? From that point out the challenge was for the film to make me feel more weight to this exchange that I openly chuckled and slightly cringed at for its seeming contrivances. In short, mission accomplished. In only his fourth big screen appearance after retiring the scar and glasses Radcliffe has made a horror picture, a romantic comedy of sorts and a historical drama where he played poet Allen Ginsberg. I have yet to see that rom-com, now titiled What If with Zoe Kazan which I think might be the most radically different thing he's done to date. 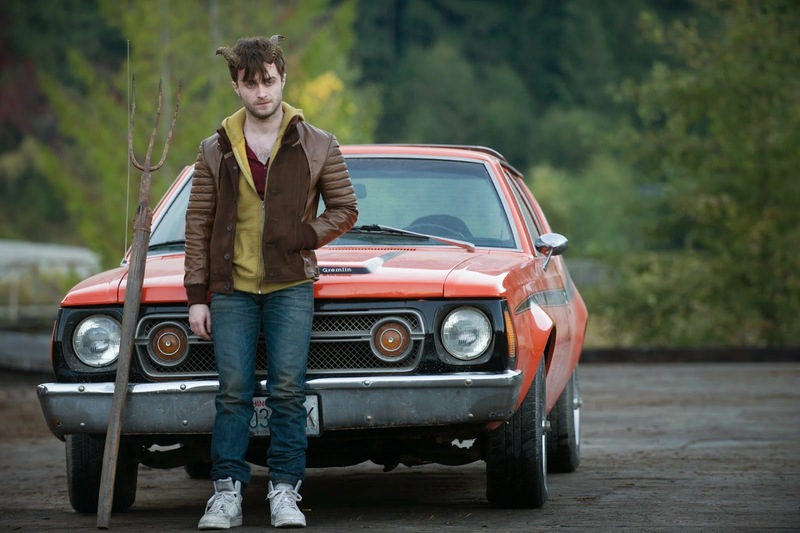 With Horns though Radcliffe has done more than I would have ever given him credit for based on the trailers in making strides to be an actor the public actually sees as an actor and not just representative of a single role. The supernatural is somewhat of a comfort zone for him and while I appreciated the aesthetic and throwback style that comprised The Woman in Black, Horns is a much deeper-minded film with more on its mind than giving audiences the creeps or gutting them with dark humor, but instead it is a rather insightful study of who we are as a race and who we desire to be as human beings and how tough it can be to discern the difference. Ig (Daniel Radcliffe) and Merrin (Juno Temple) share an intimate moment with one another. Adapted from the Joe Hill novel of the same name by Keith Bunin (In Treatment) and directed by Alexandre Aja (High Tension, The Hills Have Eyes, Mirrors) the underlying strength of the film comes from the combined talents of telling the story in a nonlinear fashion as well as the visual representation and tone implied that compliment one another relentlessly throughout instead of one taking over the other as the predominant strength. The conceit is admittedly more powerful than the way it is necessarily conveyed, but that doesn't mean it doesn't try. Ig Perrish (Radcliffe) wakes up one morning in his car after having experienced a long night of drinking and passing out to find out his girlfriend, Merrin Williams (Juno Temple), has been murdered. Ig naturally becomes the prime suspect and is being chased around town by paparazzi and taunted for these false accusations. After inadvertently spending the night with childhood friend Glenna (Kelli Garner) Ig wakes up to find two horns sprouting from his temples. While this strikes him as a point of serious concern all those he runs into don't seem to notice in the least. In fact, the more people Ig runs into the friendlier they all tend to become, opening up to him and telling him their deepest, darkest thoughts and secrets. It is here that Horns true intention is laid bare in that it means to play with the perception and ideals preached to the masses in religious communities. The idea that swaying a large group of people to think the same way, to sway "people" instead of the "person" into following a set of principles they have to take as the undisputed truth will likely do more harm than good. In approaching this delicate subject matter by essentially framing our protagonist as the devil, with the media crucifying him, and then literally giving him the physical features and presence of Satan the movie puts on display its intentions of not simply showing how easy it is to misconstrue the tightrope we walk between good and evil, but giving the opposite appearance to each and playing with your expectations by checking your mentality at the door. Going from the likes of the local doctor, a priest and on to close family members the comedy of the satire in the piece comes from all of these people confessing to Ig their pent up desires and true feelings on everything in their lives. The list of character actors including David Morse, James Remar, Kathleen Quinlan and Joe Anderson that show up in part to spout these horrible truths do so in a way that will make the viewer laugh at the outrageousness of the situation while allowing it all to work together to move the big ideas and themes forward. Having not read Hill's novel I can't say if the film closely mimics or gets the tone right necessarily, but it is one of the more blunt elements that Aja uses to really drive the emotional weight of the story home. While I was laughing at both the ridiculous look Radcliffe has to sport the majority of the film with actual horns coming out of his head and the crazy lengths the film goes to in some of its bigger set pieces, by the end of the film we'd come back to the base reason for all of the lunacy and it left a resonating feeling of both heartbreak and clarity with me. I can't imagine this will be true with every viewer because many will sit back and laugh at the more outrageous elements, others won't appreciate the seemingly mismatched tones while some will dismiss it completely for being so steeped in the lore of the devil (only proving the point of the stories deeper meanings correct). At least for me, I found much to respect in the basic troubles Horns wants to discuss in that our main character is inherently a good guy who encounters a series of life-altering events that force him into a series of unexpected scenarios. We watch as Ig is obligated to deal with these horrifying situations in a way that naturally develops his character. As we see this character unfold we are constantly assessing him to figure out if he is indeed the guilty party in Merrin's murder, but even as he is given these super natural powers he never abuses them in a way that purports a man capable of the act he is being accused of. Instead, Ig uses his new found abilities to seek out justice and in turn hopefully heal his pain though we know he'll never be able to find peace on earth again. In fact, he'd rather be in hell than live a life without his Merrin. Ig goes through some serious changes after being accused of murdering Merrin. Serious changes. As much as I value the claustrophobic tone of the environment the film takes place in, the clear color palette of browns and yellows with carefully positioned sparks of red as well as the way Aja allows long-time editor Baxter to intercut the flash backs with the current investigation to use the same nonlinear storytelling devices as the source material, what really moves Horns ahead of what I expected it to be is the depth Radcliffe's willing to go to in his performance. It would be easy to dismiss the premise of this film as hokey or, as I did in the opening minutes, something of an overly contrived effort that is simply trying too hard to be weird and obscure for the sake of being weird and obscure. To these pre-determined judgments Radcliffe has nothing to say but will instead prove you wrong. The moment the horns show up on his head we see this isn't going where we expected and that the symbolism is more important that the fact they exist at all. In the pain that corrupts everything Ig does we see Radcliffe fall deeper and deeper into the desperation to know the truth of why his world has come crashing down. The outlandish aspects of the story never outweigh this to the point it doesn't feel credible which I worried about as the film slightly drug into the final half hour. In that final half things get more outlandish than even before and so it could have easily gone off the deep end, but like the movie does with our mentality it keeps its responsibilities in check and never loses sight of the character journey at its core. This is completely Radcliffe's film and he owns every scene. He boosts both the credibility of the look while making sure the audience understands just how much of an age old human love story this is despite the theatrics. I appreciate that this feat was able to be accomplished, but more than anything I came away admiring Radcliffe's talents more than anything. Heather Graham also shows up in what is essentially a cameo role adding a bit of fun to the mix that ups the tension and satire in the casting alone while Max Minghella plays the stand-up best friend to Ig who (Spoiler!) is a bit too much of an easy target form the beginning. Besides a few small complaints in this department though Horns is a surprisingly heartfelt film with a dark facade and a profound soul.